Korea Herald: Do you have policies you are working on to make the city foreigner-friendly? 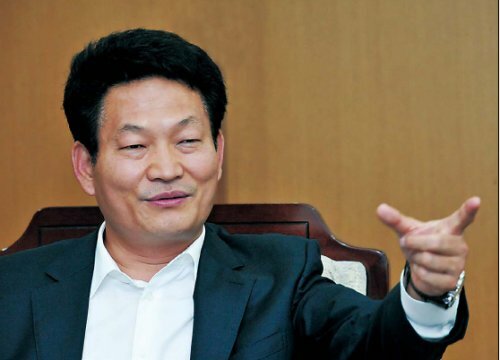 Song Young-gil: First of all, I plan to devise a variety of support programs for the multicultural families and try harder to develop Songdo into a genuinely international city. We are promoting the city’s great potential despite the sluggish real estate market. As part of the efforts, we will soon open the Jack Nicklaus golf club and the Chadwick International School. Cisco’s Asia-Pacific headquarters is also expected to come to Songdo. We also plan to bring in an international hospital although the plan to attract the Johns Hopkins Hospital has not made a significant progress yet. We have also been trying to attract prestigious foreign universities such as the State University of New York at Stony Brook. KH: You have said that you will make Incheon the “heart” of Korea. What does that mean? Song: I have this hope that I will make the city an “economic capital” and the heart of Korea. In the United States, Washington D.C. is the capital, but New York is serving as an economic capital. I will develop Incheon into a representative city of the country like New York. Incheon is in charge of 40 percent of power generation for the Seoul metropolitan area and it will increase up to 60 percent in the future. That is why the city is the heart of Korea. Incheon is not just one of the many cities in Korea. It is the country’s representative city. Former Chinese leader Deng Xiaoping forged a successful model for reform and open-door policies through the Shenzhen special zone and expanded (the economic effect) to Tianjin, Suzhou and Shanghai. Afterwards, the development spread into Pudong, Dalian and areas along the eastern coastal line and affected the development in the western region. “Choice and focus” is important. Korea’s future hinges on the new development of Incheon, which has the world-class international airport as well as the seaport. Incheon is also geographically well-positioned with 20 million consumers in the Seoul metropolitan area and 350 million consumers in China, which is not far from the city. KH: Soon after you were sworn in on July 1, you first began carrying out inter-Korean exchange programs. Is there any special reason for that? Song: Incheon is located where inter-Korean relations are of great importance. When tensions are heightened, fishermen living in Baengnyeong, Daecheong and Socheong islands will have difficulty in generating their income and investments will decrease. Companies that have invest in the Gaeseong Industrial Complex or those operating in the communist state would also suffer. The relationship between the two Koreas is crucial for the development of Incheon. The ties should also improve to make the 2014 Asian Games in Incheon successful and more meaningful. So, the Incheon mayor, irrespective of his or her ideological orientation, cannot help but strive to improve the inter-Korean ties. Humanitarian exchanges with the North should continue. On each issue (related to the humanitarian support), we can consult with the Unification Ministry. The government has allowed the provision of medicine for curing North Koreans with malaria. If we don’t take any preventive measures against the disease in the regions near the inter-Korean border, the border regions such as Ganghwa County and Paju in Gyeonggi Province would be adversely affected. KH: During your election campaign, you promised to make Incheon one of the world’s top three free economic zones. Can you tell us about the future of the economic zone here? Song: To make one of the top three free economic zones in the world, we should address the reverse discrimination that local companies have been suffering from. Local firms with global brands should first come to Incheon, which will then help induce investments by foreign firms. Rules and regulations should be enhanced, which is possible with the government support. Because of the rule that restricts the total area of a factory construction, factories cannot freely relocate. If a factory moves in the Seoul metropolitan area, it will be subjected to a heavy tax. There should be a measure drawn up to allow factories to freely relocate without worrying about these restrictions. Based on my ample experience as a politician in local and internal politics, I will meet leaders in the ruling and opposition parties and investors from countries, including the United States, Japan and China, so as to make the city the “heart” of Korea. KH: The city’s debt has topped 10 trillion won. How will you take care of it? Song: The debt situation of the Incheon Urban Development Corporation directly shows the city’s financial status. The IUDC has a debt amounting to 6.6 trillion won ($5.5 billion) and it is expected to rise rapidly to more than 8 trillion won by the end of next year. The debt will increase due to the Asian Games, the construction of (Incheon) subway Line No. 2 and other major projects. With the Lee Myung-bak administration’s tax-cut policy and the sluggish real estate market, tax revenues have been reduced. I began my term with such a difficult task. Although there will be many difficulties along the way, I will seek to find solutions in close cooperation with citizens. We have begun operating an organization dedicated to enhancing the city’s financial soundness and been trying to reduce unnecessary municipal projects to save costs. We will also scrap the projects that do not have public interest and generate little profit. KH: Incheon is ranked among the lowest in the country in terms of education. What is your plan to enhance education in the city? Song: As education is lackluster here, there have been many people who moved out of the city after earning money here. It is crucial to establish good educational facilities so as to make people want to receive education here and land jobs here as well. That is why I have promised to usher in an era when the educational budget amounts to 1 trillion won. Along with the budget for the city’s education office, the total sum will reach 2.4 trillion won and I believe this will be enough to enhance the educational level of the city. KH: You have repeatedly underscored the importance of communication with citizens. What is your definition of communication? Song: It is important to accept people’s opinions, explain to them when they have something that they have difficulty understanding and convince them if need be. That is how I can win public respect, I believe. I think communication between the mayor and citizens should continue until they feel they are truly respected and cared for. I chose this as a key expression for my municipal management, which is “making a door from a wall.” This means communicating with people through the door, not blocking the dialogue with a wall. During my term, I will try to have as many chances as possible to have talks with citizens. KH: How do you evaluate your life so far? Song: I have been working hard to build a society where the socially vulnerable, workers and ordinary citizens lead a happy life. After passing a state bar exam, I worked as a lawyer specializing in labor and human rights to help weak citizens in need of my help. After being elected as a lawmaker, I tried to enhance the livelihood of ordinary citizens. I have also thought hard on how to enhance the nation’s standing on the global stage, achieve sustainable growth, realize national reunification and establish a firm foundation for social integration. KH: Why do you think citizens here have chosen you as the new mayor? Song: People were frustrated by the city’s financial status and problems with the development of the free economic zone. They have been eagerly looking forward to some change. Citizens elected me to overcome the crisis in terms of the municipal finances, education, welfare and environment. They chose me to properly develop the free economic zone and create a new growth engine. KH: Any words you want to say to the citizens? Song: Whether you supported me or not in the election, you all are who I should serve. I will work for social harmony and advancement beyond the conflict and confrontation we had during the election period. I will manage the municipal affairs in close cooperation with citizens. To take the city to another, higher level, we should take pains to take care of the by-products left behind by wrong policies. I believe that with your hope and passion, we can tide over all this.